Improve your golf cart's storage capacity and passenger comfort with the newly redesigned ModzTM "Classic" rear flip seat kit. The ModzTM "Classic" rear flip seat kit is designed specifically for Club Car DS and Precedent golf carts. The "Classic" seat kit is built from a precision laser cut frame with no welds for greater strength even under the most extreme loads. 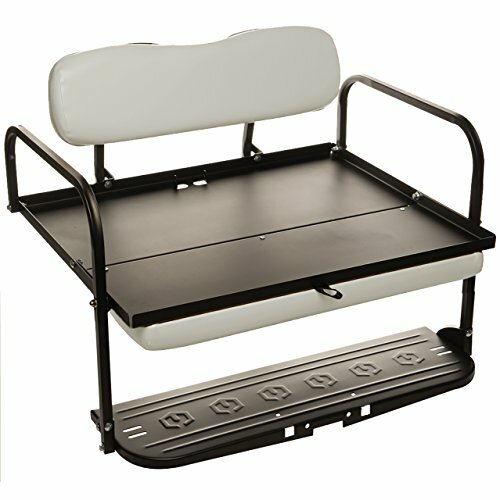 The rear flip seat kit features a durable steel plate cargo bed and a 360-degree bed rail to help keep your cargo secure while on the move. The newly redesigned "Classic" rear flip seat kit also features a more versatile one-piece foot rest with convenient pre-cut cargo strap holes, receiver hitch slot and integrated rear seat belt tabs.